Can I pull it?” asked high school senior Braylee Armajo as she reached for the deep yellow cord on Chicago Transit Authority Bus 8. 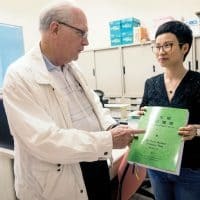 “Not quite yet,” replied Kate Macan, a Maryknoll mission educator. “How about now?” Armajo asked again. “Almost,” Macan said. “OK, now you can pull it,” Macan instructed. Braylee Armajo tugged the signal cord as the CTA bus approached the 51st and Halsted stop in the Back of the Yards Neighborhood in Chicago. Armajo, her five schoolmates and three chaperones arrived in Chicago last March after two early morning flights and many months of preparation. They are all part of a social justice group called Voices of Hope at the St. Labre School, where boys and girls from the Crow and Northern Cheyenne tribes are students. The six young people left family, friends and culture behind to explore how other youths in the nation’s third-largest city use their voices and work for change in their communities. toward Precious Blood Ministry of Reconciliation for a morning of reflection. The week-long immersion experience took the St. Labre students around the city, visiting schools, after-school programs, a community garden, and nonprofit organizations focused on providing support to migrants and immigrants. The St. Labre students started with a visit to the Muslim Community Center (MCC) in Morton Grove, Ill. 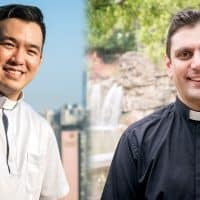 There they dialogued with Muslim youth about the Muslims’ lifestyle, the harassment and discrimination they face daily because of their religion and the current negative attitudes toward Muslims in the United States. Hearing about life as a Muslim youth was eye-opening for the Montana students. 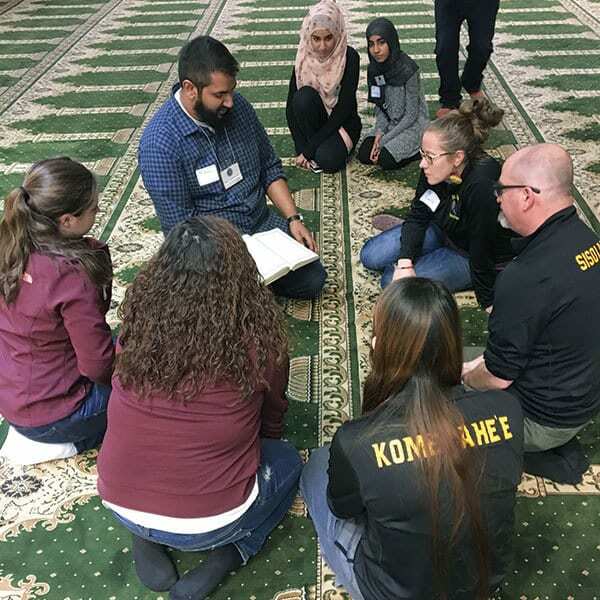 In their discussions at the Muslim Center the youth explored cultural practices and spiritual traditions from Christian, Muslim and Native American perspectives, and found many connections, especially around faith and culture. “Having a community where they are all Muslim and have all the same traditions, that’s what we of the Crow tribe should be doing … because we’re losing our culture,” Braylee Armajo said, reflecting on the MCC mission and the commitment of the youth to actively expressing their faith. J-Def Peace Project, a Chicago organization that empowers youth to promote peace. 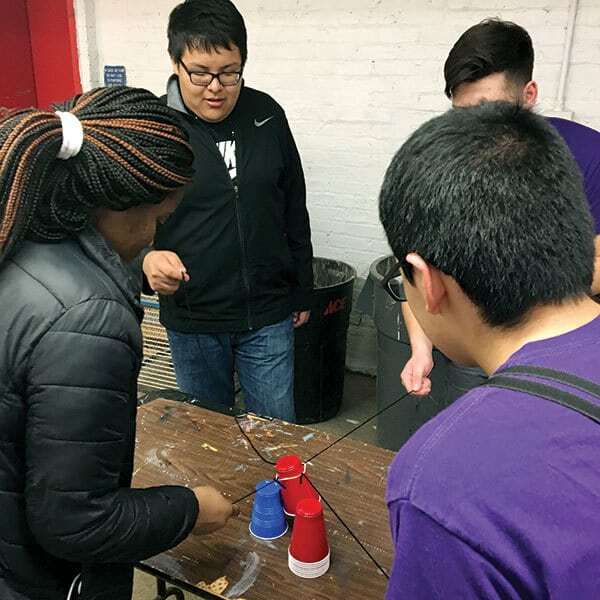 At Cristo Rey Jesuit High School, a college-preparatory school for inner-city youth of Chicago’s Southwest Side, the St. Labre students participated in a refugee simulation activity organized by the Cristo Rey campus ministry staff. For several hours, the students experienced the lifestyle of a refugee, which often includes a poor diet, lack of access to running water, abysmal educational opportunities and makeshift shelter. The bond forged between the St. Labre students and the Cristo Rey students, who pay for their tuition through a work-study program, led to a tour of the surrounding Pilsen neighborhood, followed by an evening of table fellowship and dance. 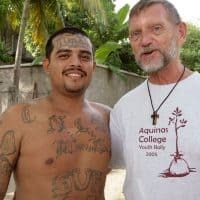 The spirit of openness that the students maintained during the week enabled them to embrace encounters with strangers and “others” as more than chance encounters. 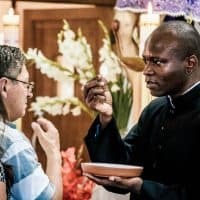 Through conversation, prayer and ritual, strangers became friends. 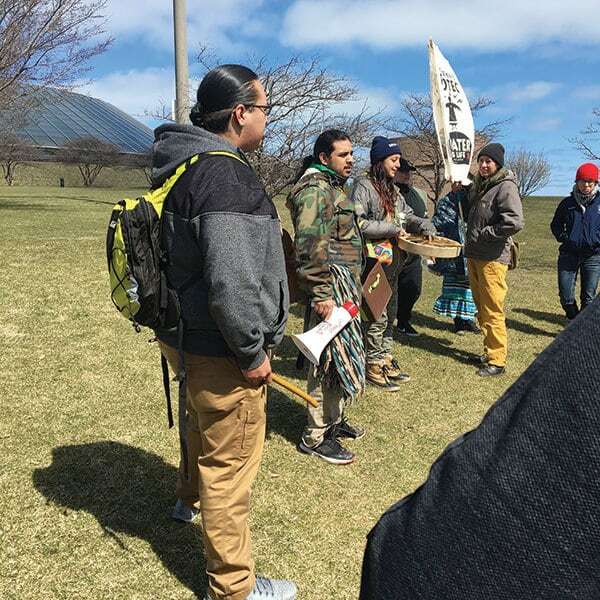 St. Labre chaperone Bucky Old Elk (l.) gathers with Chicago water protectors before World Water Day of Action rally to raise awareness about threats to natural resources. 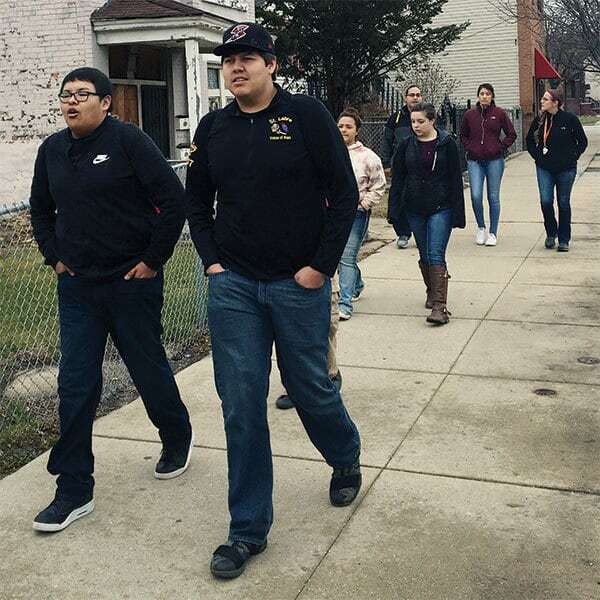 While touring the Pilsen neighborhood, the students met Efrain Montalvo, who is involved with local efforts to raise awareness about opposition to the Dakota Access Pipeline, a controversial 1,172-mile long underground oil pipeline running from northwest North Dakota, through South Dakota and Iowa, to oil tanks in Illinois. Various Native American tribal nations have opposed the pipeline, saying it violates sacred burial grounds and threatens water sources. 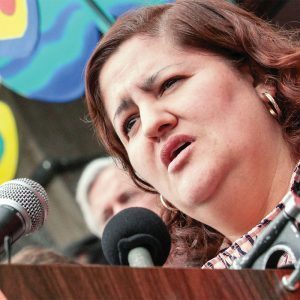 Montalvo invited the group to join approximately 50 other people at a rally to celebrate water and spread awareness about current business and governmental initiatives that could pollute water sources in the United States and destroy sacred lands. The group marched down the city’s famous Lake Shore Drive, attracting the attention of passersby. “We all came together as one big family and decided that we were going to do this march,” Maddie York said. The St. Labre students live in communities that historically have been negatively impacted by governmental initiatives. This day, they joined others and used their voices to say “no” to the destruction of lands and pollution of water and “yes” to preservation of natural resources. 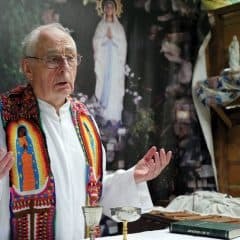 At the St. Kateri Center, a ministry of the Chicago Archdiocese to serve Native American Catholics in the city, the St. Labre students continued to bond with urban counterparts. Sharing a meal and blessing, the students from St. Labre and youth from the Kateri Center dialogued about their different experiences of being Native American in the city and on the reservation. “Rafael, a youth at the Kateri Center, taught me so much about being an urban Indian,” said Armajo. Despite differences, the youth realized that their shared history and desire to create a different, better world unite them. On their next-to-last day in Chicago, two of the students, Jorgi Little Eagle and Kaelene Spang, now experienced with the public transit, took the reins in navigating their way through the city. But the students from St. Labre left Chicago with more than the ability to navigate the CTA. In a mosque, the Montana visitors get a lesson on the Quran from Mohsin Ishaq, youth coordinator at the Muslim Community Center in Morton Grove, Ill.
Trusting the navigation skills of her peers, Braylee Armajo talked and laughed with her classmates as they trailed behind Little Eagle and Spang walking through Chicago’s Museum Campus. Feature Image: St. Labre students and chaperones pause at Chicago’s iconic “bean” sculpture. Kate Macan, from Kansas City, Kan., is a Maryknoll mission educator in Chicago. 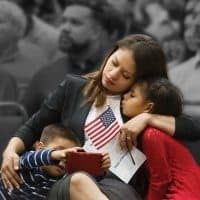 She has lived in the Dominican Republic and Nicaragua and worked with inner-city youth teaching English, facilitating retreats and running after-school activities.